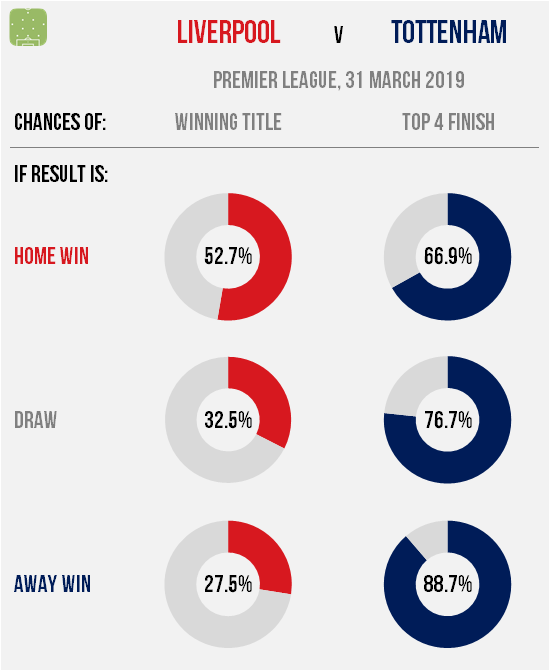 The stakes are much higher for Liverpool here, with even a win only able to keep them marginally head of Manchester City in the title race. Any points dropped would likely hand Pep Guardiola a sizeable advantage, with a Spurs win slashing the Reds’ prospects to around one in four. For the visitors there is the incentive of increasing the likelihood of hosting Champions League football in their new stadium next season to almost 90%, but even defeat here would probably see their prospects remain at roughly two out of three. 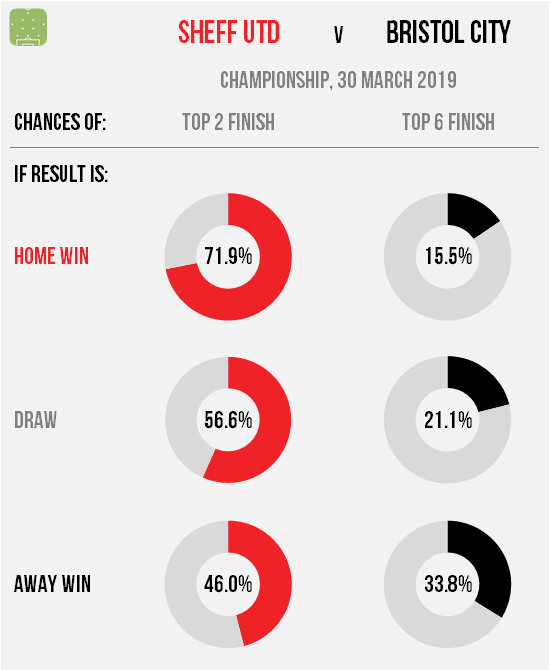 The Blades’ recent win over Leeds has allowed them to edge ahead in the automatic promotion race and a win here would likely see their chances of securing a top two finish rise to over 70%, but anything less keeps the door open. Defeat would probably see the advantage swing back towards Marcelo Bielsa’s side, while also resurrecting Bristol City’s play-off hopes. Despite the Robins sitting just two points outside the top six, the model is pessimistic about the prospect of them closing the gap due to their tough run-in. This is the first of five remaining fixtures against clubs sitting above them in the table, so even if they win this they’d probably still have around a one in three chance of making the play-offs. These two teams have suffered a recent dip in form that has left their fate far from certain but both could take a huge step with a win here. 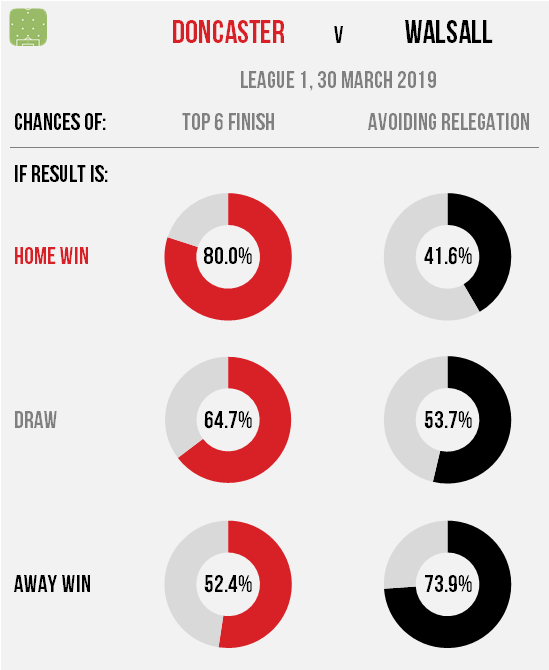 For Doncaster a win could boost their chances of seeing off any late challengers for their play-off place from a shade over 50:50 if they lose here to around four in five if they can see off Walsall. The Saddlers have been dragged into the bottom four and their goal difference is worse than most of the teams they are chasing, so a win would be huge for them too (particularly as the model isn’t optimistic of their chances in this game). There’s plenty at stake for both sides here in their respective promotion campaigns. The hosts are three points inside the play-off places with a pretty healthy goal difference and could shore up their advantage with a win here, but defeat would likely strip it back to almost 50:50. 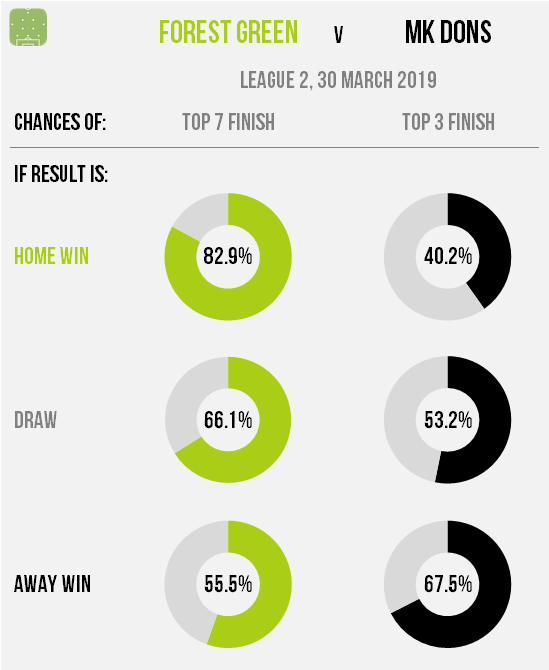 MK Dons are inside the top three by the same margin and could increase their likelihood of automatic promotion to roughly two in three with an away win, while defeat would open up the possibility that Mansfield or Tranmere edge past them.